Here it is again - March Mayhem time! The Escapist's annual tournament pits game developers against each other in head-to-head matchups to see which company reigns supreme. This year we're doing things a little differently by including as many independent developers as big names in gaming. Companies that make games with huge budgets are great, but we love Cinderella stories at The Escapist, and we want to recognize the amazing things independent developers do with limited resources just as much as we do the massive games out there. Now you can too! Starting on February 24th, you can fill out your own bracket guessing which game developers you think will win their head-to-head match ups and make it to the last round. If you accurately predict what the community picks throughout the whole bracket, we'll give you a year of The Escapist Publisher's Club for ad-free viewing of the website and high quality video streams on iOS devices, among a slew of other perks for the forums. We're giving away 10 Pub Club subscriptions to the users with the most accurate brackets. And that's open to most countries such as the U.K., Canada, Australia and New Zealand, not restricted just to the U.S. Check out the full legal rules here. The game developers chosen by our community in a runoff poll will go head-to-head in five rounds of competition. The first round will begin voting on March 3rd, and each week you'll get a chance to vote for more games before we whittle the competition down to just two developers in the final week of March. Click here to start filling out your bracket now! For those of you unfamiliar with bracket tournaments, game titles will be matched up against one another for one week of voting. Feel free to use your social pull on Twitter or Facebook to get votes for your pick and make sure it advances to the next round. Whichever game developer gets the most votes from the community will be declared the winner of that round, and then will be matched up against the winner of another head-to-head matchup. 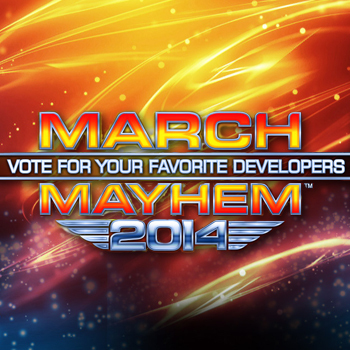 With 16 developers, there will only be four rounds before the winner of March Mayhem 2014 will be declared. For a detailed description of how the March Mayhem 2014 bracket will work, click on the How-To page or check out our official legal rules. Click here to start filling out your bracket now and see the 16 game developers who will duke it out this March!